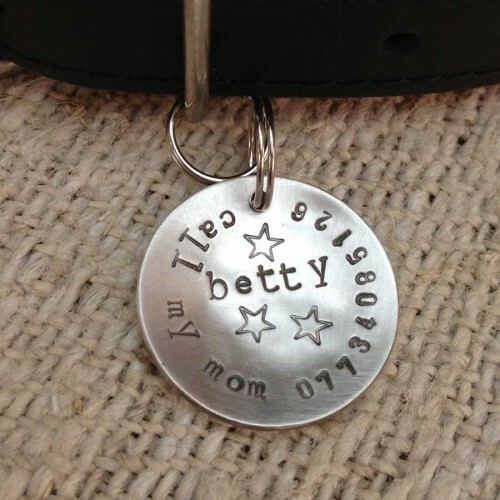 Our Hand Stamped -Custom Made- Sterling Silver Dogeared ID Pet Disks are good enough for you or your pet to wear, and are sure to become a keepsake you will want to keep forever. 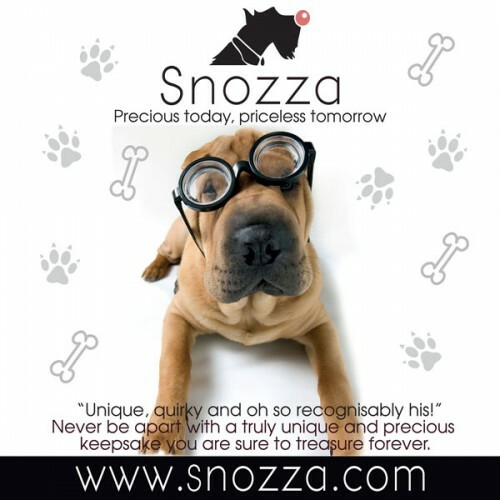 Everything on the Snozza website is handmade to order in our Biggleswade Studio. 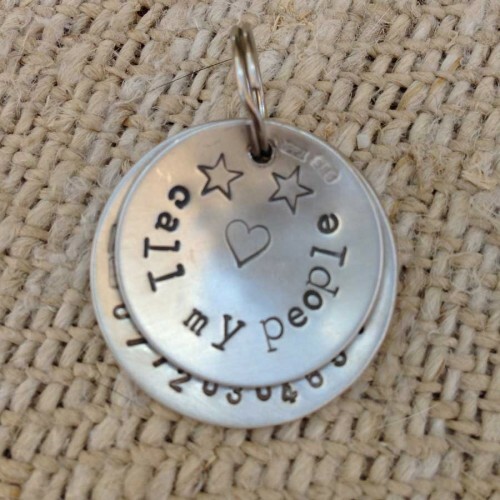 We will hand stamp your lettering on a sterling silver pendant to get the look just right- we don't aim to be perfect, we don't aim to be straight, we aim to be little off skew! 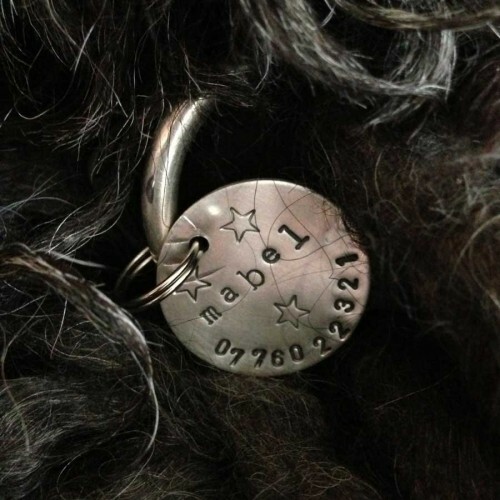 We then carefully make a hole for the strong split ring, hammer the disk into gorgeous curved dome shape, so it’s not flat and boring, and then we sand, brush and polish your pendant so that it has a satin, matt finish that it will fabulous when you clip it to your dog's collar. Choose from the suggestions below or use your own words up to 32 letters including spaces. We can even add dog bone shapes, a stars or hearts, if there is enough space left and it does compromise your lovely tag. Our Disks come in three sizes 32mm, 26mm and 20mm. This pendant is the largest size 32mm, and you can opt to add the smaller 26mm disk for £30.00, they look fantastic when worn together as they nestle together perfectly, and are sure to look nothing short of fabulous!! 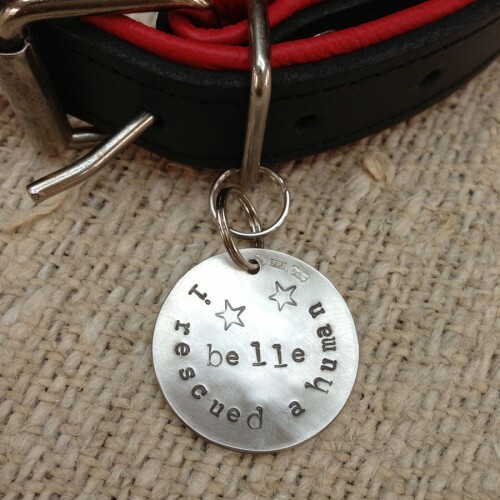 I understand all lettering is handstamped without punctuation or capital letters in our "Dogeared" font!